My eldest son now has a job and of course, I'm over the moon. No only does he have a job but it's also in his area of interest and there's a traineeship component. He's going to thrive there. His employment is the culmination of years of planning and it all went so smoothly that I wanted to talk about it because I feel it's a model that others can follow. In part one of this two part post, I want to look at how you can use the last few years of school to get your teen prepared for a job. Before I get into the "how to", I just wanted to take a look at the statistics for people with autism being unemployed, under-employed (in lower paying jobs than they should be) and not completing higher education. The results are grim and the story is similar worldwide. In fact, I'd venture to say that statistics and support in Australia are a little better than most places overseas. 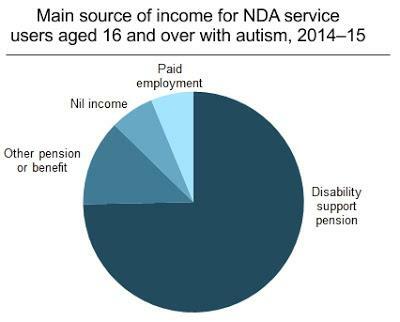 The chart shows how few people on the spectrum are in paid employment and it's scary enough but it's important to realize that only takes into account people on the NDA (National Disability Agreement). It doesn't account for people who are undiagnosed, were diagnosed as adults or haven't attempted to use their diagnosis to get support. The real statistics for employment are much lower. Additionally, the reports say that "people with autism are less likely than others to complete an educational qualification beyond school". For example, people without autism were 4.5 times more likely to have a bachelors degree. The last years of school can be quite tough and depending upon how your teen is doing academically, you might be facing a few choices. If they're doing well at school, there's no need for a change. If they're doing well academically but struggling socially, then you really need to keep them in their mainstream school until they finish. Much of your focus at school should be directed towards making their general day-to-day social contact easier. Allow them to finish school early. Finishing school early should only be a choice when your teen has a job to go to and is mature enough to do it. If your teen is going to finish school only to sit at home unemployed and play video games, then it's best to keep going with school. Some kids thrive out of school but if you're thinking that this is the direction that your teen needs to go in, you should get them to do part time work for at least three months before you make your decision. Finishing school early will often close the doors on higher education (at least for about five years), so it's a choice that you shouldn't make lightly. If your teen isn't coping academically AND is also struggling socially, then a special needs school might be a better choice. Just remember that special needs schools don't always result in better grades. You're sending your child there for "comfort" but eventually they'll have to interact with mainstream adults. So essentially, you're simply delaying the inevitable. If this is the kind of break they need, then go for it. If your teen is struggling academically but is coping reasonably well with the social aspects of school, particularly if they have a group of friends, then it's best to leave them at school. This is especially true if you feel that they're too immature to hold down a job yet -- advice that applies to boys more than girls. You'll find that many schools can offer a "life skills" program which essentially lowers the standard of work expected. Your teen will still get assignments and participate in classes however instead of being served reports with disheartening Ds and Es on them, they don't get a mark. They do however get a certificate that says that they have completed their schooling. Many "life skills" programs at schools also include different types of learning which are more applicable to jobs, for example the kids in these classes may do food bank projects, white card "health and safety" certifications or develop other skills that will lead straight into a job. You shouldn't underestimate the potential of life skills. Switching to something like life skills can temporarily (for about 3 years) close the doors to higher education such as university - you can often apply later as a "mature aged student". It's not a decision to take lightly however university education isn't everything and the reduction of academic pressure can make your teen's life at school so much more bearable. Getting extra help, such as tutors, is probably the very best solution if you can afford it and if your teen is able to benefit. Just be aware that sometimes the extra help comes too late (if they don't have the basics) and that sometimes the added pressure to perform can be too much for your teen. If it works for your teen, go for it. By now you should have a fairly good idea of your teen's special interests. These are absolutely key to their getting a job, so whenever possible make sure that you try to find ways that they can connect to the workforce. Many special interests have associated magazines which may have articles where people talk about their work. If you can find these, it's worth giving your teen a look at some of the jobs that may be available. It could give them something to aim for. 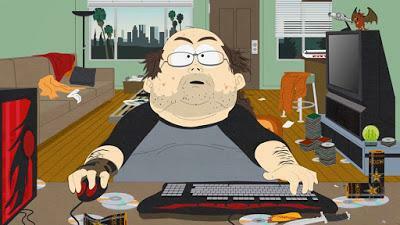 If your teen is interested in computer gaming, try to broaden this to general computers by introducing different operating systems and applications. If they're obsessed with anime, try to get them drawing their own figures and styles rather than simply copying others. If they're into writing or geology or fitness, they're already on their way but if their interests are limited to Star Wars or Spongebob, you'll have to work a whole lot harder to broaden them to other things. Anyone on the spectrum working in an area that fits their special interest will automatically have a huge advantage over others. I can't stress enough how important work experience is to kids on the spectrum. It's such a pity that many schools today don't do it -- often for insurance reasons. It's not uncommon for kids in senior school to have a part time job, such as working at a fast food outlet but unless this relates directly to your planned long-term employment, this isn't going to give you a big enough boost to put you above the competition when it comes to an interview. If your school won't offer your teen on the spectrum any work experience then you'll need to organize it yourself. The other thing to note about work experience is that two weeks is certainly not enough. When it comes to teens on the spectrum, work experience needs to happen across a much longer period in order for them to settle and to take away a true learning experience. If it's at all possible to find someone you know in a connected field, then this is the best option. If you can't find anyone in the area, you can cold-call companies but it's often better to post in local autism and Asperger's forums to see whether anyone can help. A parent who already has a child on the spectrum will be far more understanding as a "boss" when it comes to work experience and they'll probably be keen to offer their help. Work experience is unpaid work and since it's meant as a "taster", it should be fun and fairly diverse. A work experience position where you simply shovel dirt all day is not going to be of much use to anyone. The same goes for an IT position where your teen is expected to sit around all day without having been given any work. You need to keep on top of what is going on and you need to ensure that the work is at least interesting and a little challenging for your teen. Work experience should never be "boring". To do this, you need to talk to your teen at night and ask what they were doing at "work", how they felt and what other people were doing. You also want to encourage your teen to talk to other people at work in order to develop a fuller understanding of what the company does and how it goes about it. It's important to ensure that your teen provides benefit to the company they're working with. Work experience is essentially a "free worker" for them but they'll be more likely to provide a positive experience for your teen if they feel that they're getting benefit too. In order to get the hours up, your teen will need to be prepared to put the time in. In our case, my son did work experience on and off for two years, spending most of his school holidays in the office as well as any "pupil free" days, exam days (when he didn't have exams) etc. As a result, he developed a lot of good workplace skills and met people who were willing to act as references for him. Up to now, it's likely that you've been waking your teen with autism every morning, perhaps you've been finding clothes for them to wear (or perhaps they wear the same uniform every day). It's also probable that they're not showering as often as they should and that they aren't using deodorant, packing their own bag or making their own way to school. Work experience is your opportunity to change all of that. You'll still need to help but you'll want to start encouraging your teen to make decisions for themselves. This means that they need to be able to tell you what sorts of clothes others are wearing to work, what kinds of foods people take to the office for snacks and how people at work greet each other and answer the phone. You'll need to write these things down, so that your teen can start to work through the list and pay attention to things around them without actually going up and asking people. Make sure that they don't write things down where people can see them and that they don't ask people directly. It might make their co-workers nervous. You'll need to see what they intend to wear to work ahead of time. For example, people at work might be wearing T-shirts but you'll need to make sure that your teen chooses shirts which are clean and free of potentially offensive slogans and drawings. Similarly, you'll need to keep an eye on hygiene and make sure that your teen doesn't smell. Smelly teens are acceptable in school but not in the workplace. They'll need regular showers and deodorant -- and they'll need to brush their teeth and hair. Food is also important, particularly if your teen has issues with feeling food on their face. You'll need to encourage them to look in the mirror regularly, remind them to chew with their mouth closed and watch their choices, not for health but for spillage. A teen who wears white shirts and eats ice cream for lunch is a recipe for disaster. Finally, time management and transport are great skills to develop during the work experience period. You'll need to encourage your teen to start taking public transport and to plan their day to get to work on time. You can do this by gradually backing off on "being their alarm clock", by taking them to the train station or bus stop rather than driving them to work and by getting them to make the best use of the transport apps they have on their phone. Fortunately, with work experience being unpaid, mistakes such as catching the wrong train and arriving late aren't going to get them fired. It's best that they make these mistakes now, rather than when they get a real job. Next time, I want to talk about applying for jobs, resumes and interviews.